Memorial Day, the traditional if unofficial beginning of summer, was last Monday, and it definitely feels like summer. After a surprisingly long spring–for here, anyway–temperatures are beginning to hover around the 90s, humidity has returned, and the nights are warm as well. I wonder what the months of July and August will look like–more of the same, or substantially hotter and muggier? And consistent with the advent of summer, the vegetable garden is coming on strong. 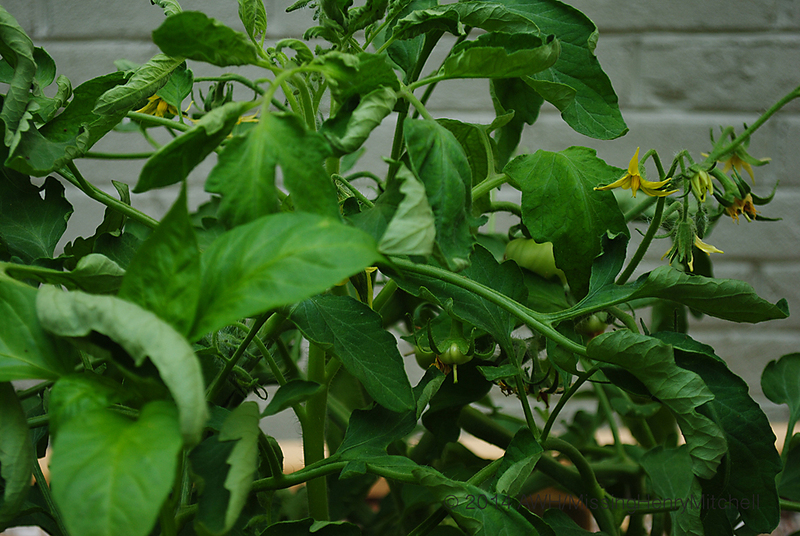 I have small tomatoes on ‘Sophie’s Choice,’ a short-season variety I’m trying for the first time this year. Tomatoes ‘Black Prince’ and ‘Principe Borghese’ seem to grow three inches a day, and I pinch suckers every morning. I must get to work on finding some taller stakes. 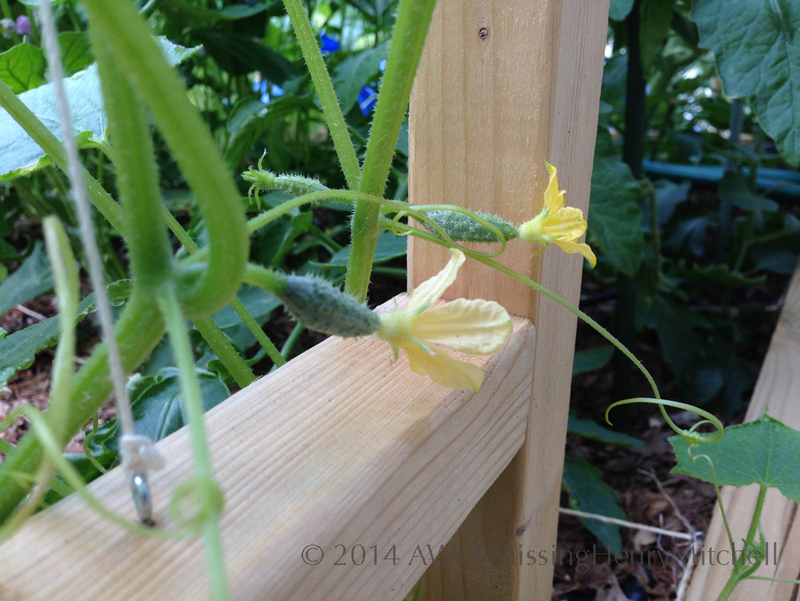 I’ve also got tiny little pickling cucumbers coming along. I’m the only one in the house who loves pickles, so every fruit is for me. Now I need to find the perfect recipe to make those cukes taste like the pickles I used to get from the deli in Chicago. I wonder if the deli would share their recipe? Must remember to ask. I can’t believe I’m still picking peas in June! Around here, spring usually lasts a week, and a few days in April in the 90s spell the end of the seasonal snap pea attempt. I didn’t plant very many peas but I’ve harvested at least a quart already. That many not seem like much, but in the past, I’ve felt fortunate if I could pick enough in a spring to add to a pasta salad. I’m trying not to let the success to to my head. Bush beans are looking rather vital and vigorous, and so far, no sign of flea beetles. There; I’ve tempted fate. I’ve got tiny Anaheim peppers on two plants and am waiting for the jalapeños to catch on. Nasturtiums planted in the corner of the bed are green and healthy–but I think the soil may be a bit rich for them to produce many flowers. Or maybe I’m suffering my typical lack of patience. Do you grow calendulas? I’m trying those for the first time this year as well. I can’t explain why it’s taken me so long to get around to trying these. Lots of basil–I never have enough. The lettuce is hanging on since I covered it with shade cloth. The 4-year-old next door thinks it’s crazy that my lettuce can get a sunburn, so I showed him the leaves that got a little crispy in the sun one day. I don’t think it was quite what he had imagined. Physalis ‘Cossack Pineapple’ plant growing rapidly. The shiso seedlings died, so I’ve got to start some more. And this year I’m trying another new thing: ground cherries (Physalis pruinosa). This plant likes it hot, for sure. It seems to double in size for every day we have over 90 degrees. This pattern cannot be sustainable, or it will be The Plant That Ate Durham before the kids are out of school for the summer. 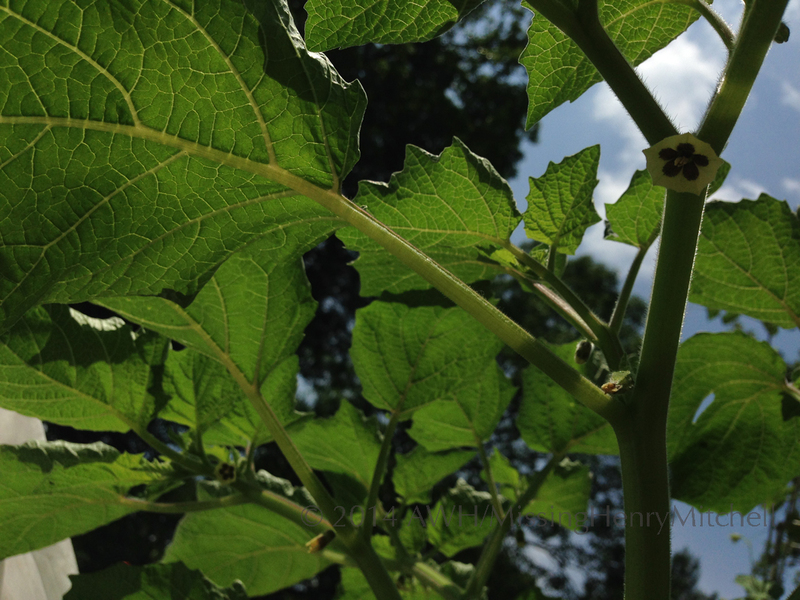 Tiny flowers already appear beneath the giant leaves, but I think the fruits will take a while to form. I’ll let you know. I got the fig tree transplanted earlier in the spring, and it seems to be settling in nicely. I’ve got lots of little figlets already; I hope it will fruit more productively now that it’s out of the container. I can’t wait to have my favorite fig and goat cheese sandwiches! Hope your garden is doing well. What’s the veg you’re most excited about this year? 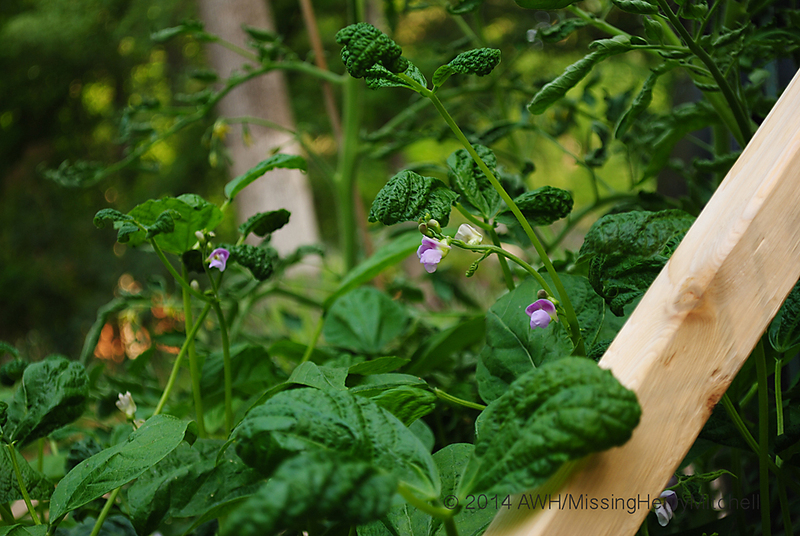 This entry was posted in 2014, Dear Friend and Gardener, Edible Plants, Fruit, Garden plants, Vegetables, Writing and tagged beans, gardening, ground cherries, grow your own food, peppers, tomatoes, vegetables by missinghenrymitchell. Bookmark the permalink. I love black tomatoes; they’re my favorites. I think they have the richest and most savory taste. Hope you enjoy them! My vegetable garden is barely starting. I do have Mortgage Lifter for the first time this year. The peas are not even up! Although I was late. I’ll be giving a full report in about a week and I hope the peas are up by then. Your garden looks wonderfully healthy. I can’t wait to have so much green. Thanks! So far, so good. Where are you located? It seems you can grow wonderful tomatoes in the States, they always get blight here. I have lots of lovely veg coming on in my new raised beds. It looks as if I am going to get nice straight carrots. I am growing scarlet flowered broad beans this year for the first time. I don’ t know what they will taste like but they are pretty. 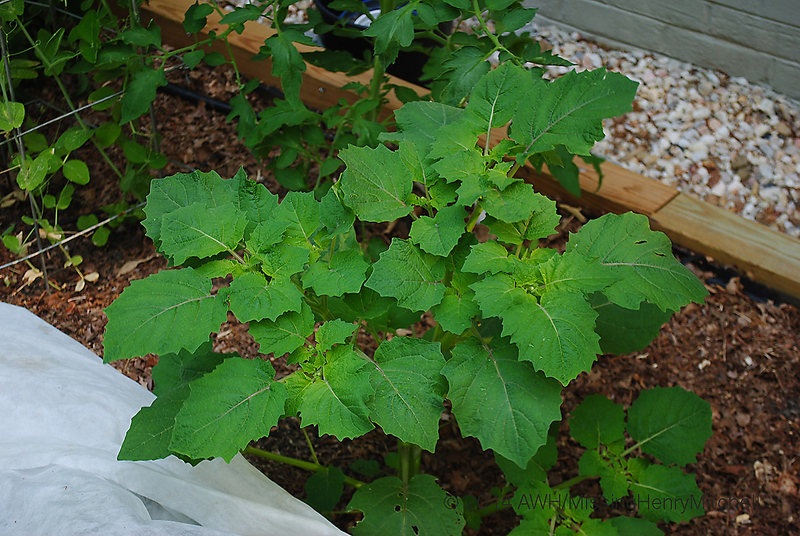 Your ground cherries will get really wide and may come back next year if you let a few fruit fall. Make sure not to let your pets/kids eat any of the raw cherries as they’ll make them really sick. Once the cherries have a dry husk and are yellow, they’ll be ready. I grew them a few years ago. It looks like you’re off to a great start! Fantastic! Thanks for the great info. Hmmmm. You had little figlets two weeks ago and mine are only now rising from their winter induced grave…. I think I need to look into a little protection for next winter. Things look great there but we’re still having sweatshirt weather here. Lettuce and cabbages are enjoying the weather but it’s sure not pool time yet.